The moment HGST announced helium filled hard drive, we thought that it would be a challenge to open it and make some analysis. When the drive came to our offices, we started brainstorming how to open it. Since we didn't know what is the structure of the casing, the idea came to open it using the cnc mill. 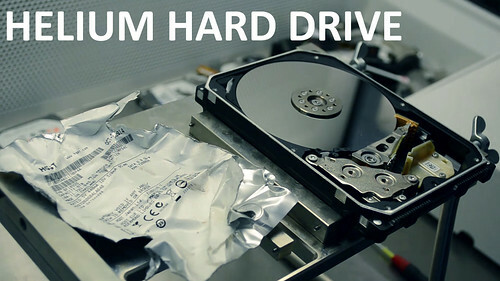 Also, you can visit our blog and leave a comment on Opening the helium hard drive - Video article. Quick question, since you opened it up did you try running it after it was filled with regular air? I'm just curious if these would be stable enough to image without refiling with helium (using pro tools of course). It would be tough to tell if failure was due to regular air or debris from grinding it open. But, a perfect clone would certainly be positive news. To test the helium -> air effect, I suppose you could just drill a small hole somewhere away from the platters, let it sit for a bit in the clean room, and then run it. As I understand it the helium just creates less drag so the sliders can glide closer with less vibration. Question is would the air cause them to fly higher and stop reading, or vibrate and beat up the sectors. When the price drops a bit I might have to buy one to just test it without the helium.